A pre-defined email patterns with Name, Subject, and Body which are sent as automated response as an acknowledgement. The admin can set various email templates for any event to keep the clients informed about their issues. Within e-mail templates, there are placeholders which allow you to insert a snippet of codes (placeholders) at various point in your document, which is automatically replaced with their respective values at the time of execution. Using placeholders, the process of manually looking up certain information required in a document is greatly simplified for you. On your booking commerce dashboard, click on Configuration. 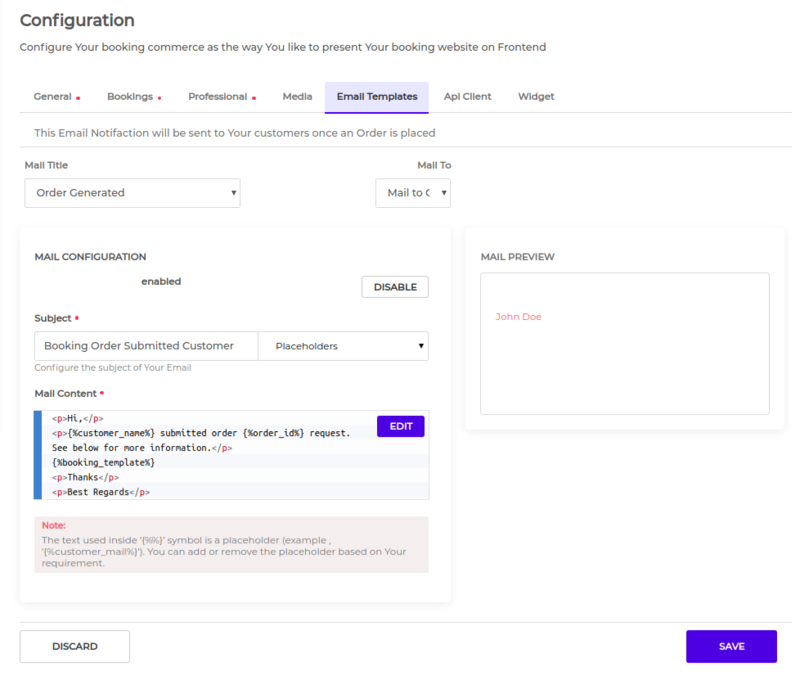 You can then go to Email Templates section where you will see the pre-defined email templates already created for the different activities performed either by customer or member. To edit any template, you can simply click on the email template and go to the content area. You can start editing the template from there and even place the placeholder from drop-down wherever needed. Click the Edit button and edit the mail content.